“Doublespeak. The deliberate use of ambiguous terms in order to deceive the public, is designed to make lies sound truthful and murder respectable, and it’s the kind of language we hear constantly on TV. But why does the mainstream media comply with its use? “Well, that’s what happens when governments transfer the public airwaves to private corporations in a practice known as deregulation. In this environment, reporters lose their autonomy in exchange for military protection, they are co-opted or embedded. “A war that most nations refused to support becomes the War for Democracy. “Torture is re-named enhanced interrogation techniques. “An unprovoked attack is a preemptive strike. “A dissenting hero killed by his own army is the victim of friendly fire. “Civilian deaths are collateral damage. “A trade system that generates international economic inequality is referred to as globalization. “A 70-million-dollar ballistic missile is a Peacekeeper and a 3-million-dollar anti-ballistic missile is a Patriot. Those are the words I found in a graphic image posted on Facebook by a site called “Beware of Images.” Although this site is lacking in information about their feature-length, animated documentary about the history of visual representation (it doesn’t state how or where to view the docu, nor if available for purchase, or if it is not yet released) it does include a few very powerful messages, more so on their Facebook page, Beware of Images. 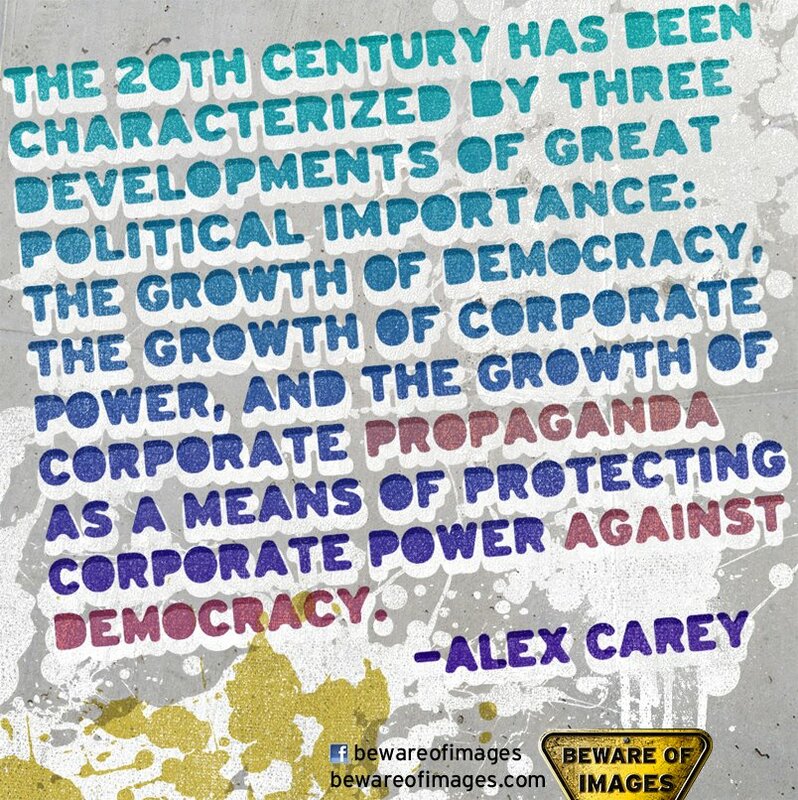 The 20th Century has been characterized by three developments of great political importance: The growth of democracy; the growth of corporate power; and the growth of corporate propaganda as a means of protecting corporate power against democracy. ~ Alex Carey. An Australian social psychologist who pioneered the study of corporate propaganda. He influenced the work of Noam Chomsky, Edward Herman and John Pilger, among many others. Translation: Oil, money, power, corruption, greed, and western centralized banking (The Federal Reserve, the Rothschilds, etc). Do not question authority. We are the country’s drones and the “men behind the curtains” are starting to realize that more people have awakened to the reality of our world and threaten to bring them down. Let me wind up this posting with a tidbit from Beware of Images website followed by a scene from the movie, “They Live.” If you have not seen it, please… watch it. There’s more truth to that movie than most people will ever realize – and I wish they would become aware. “….Beware of the seductive and deceptive power of images. Here is the full length movie on YouTube. Not sure how long this will be available…. When I first saw this years ago, I thought it was a great sci-fi movie. More recently I have come to realize that this movie has more truth to it than fiction. Simply correlate the aliens with government and big corporations. And the sunglasses are our media and consumerism. Great post, Michelle. 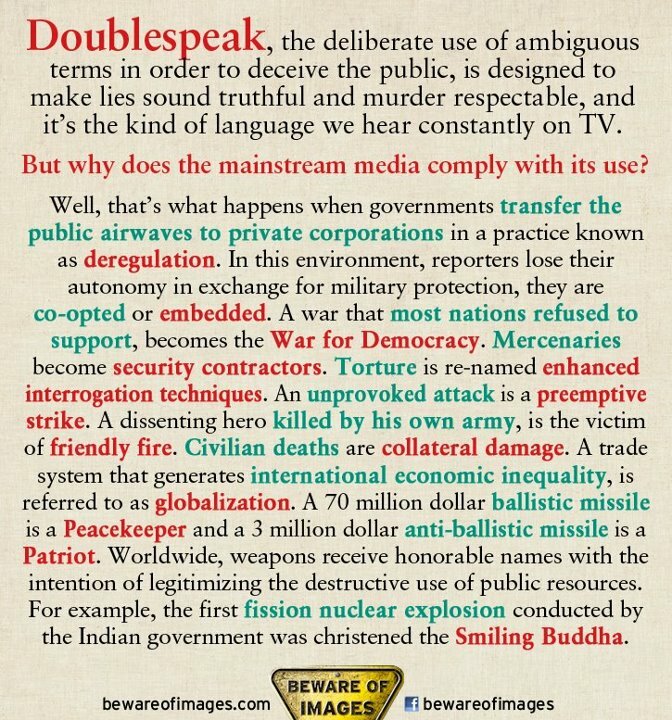 Doublespeak surrounds us and is used to keep us as ignorant, apathetic, blind to the truth, and as harmlessly pacified as the Masters of Doublespeak can make the masses. But I still think that there will be a day of reckoning because however diabolically clever the Masters of Doublespeak are, they are also blind to the fact that they have put the massive weight of their system on a poorly deigned and weak foundation that they didn’t make the effort to build strong enough to last long term, because all they care about is the short term gains that enrich them ASAP. So the entire system will inevitably collapse under it’s own weight when the weak foundation it was built on crumbles and falls apart. The financial crisis of 2008 was a big crack in the foundation, but still relatively minor compared to what will happen when the real collapse brings everything crashing down. Unless somehow enough people start paying attention and unite to find a way to stop it and then actively work together to save all that is worth saving. I really liked the clip from “They Live” and I hadn’t seen it until now. Thanks for sharing it. I’m watching the entire movie right now. It’s been a long long time since I’ve watched it. It starts out with a “neighborhood” of legitimate homeless people and one man is discussing how the middle class is disappearing. And this movie came out in the late 1980’s. (sigh) So much foreshadowing in this movie it is unreal! 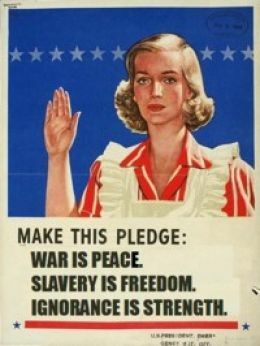 Doublespeak has been alive and well since before I majored in it back in the Dark Ages. It was called advertising. Advertising? It’s also called religion!